Countless studies demonstrate that students with parents actively involved in their education at home and school are more likely to earn higher grades and test scores, enroll in higher-level programs, graduate from high school, and go on to postsecondary education. Beyond the Bake Sale shows how to form these essential partnerships and how to make them work. 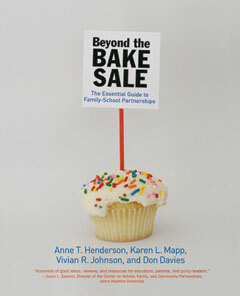 Packed with tips from principals and teachers, checklists, and an invaluable resource section, Beyond the Bake Sale reveals how to build strong collaborative relationships and offers practical advice for improving interactions between parents and teachers, from insuring that PTA groups are constructive and inclusive to navigating the complex issues surrounding diversity in the classroom. Written with candor, clarity, and humor, Beyond the Bake Sale is essential reading for teachers, parents on the front lines in public schools, and administrators and policy makers at all levels. Anne T. Henderson is a senior consultant with the Annenberg Institute for School Reform at Brown University. Karen L. Mapp is a lecturer on education at Harvard University and former Deputy Superintendent for Family and Community Engagement in Boston. Dr. Vivian Johnson is the leading researcher on Parent/Family Centers in schools. She lives in Boston. Don Davies is the founder of the Institute for Responsive Education and Professor Emeritus at Boston University.